The Bush Administration’s budget won’t be released until next week, but it already has poured fuel on the fiery debate over health care costs by estimating that the 10 year cost of the new Medicare bill will be more than $530 billion, one-third more than Congress’ $400 billion estimate. Entitlements ALWAYS cost more than we think. When Medicare was enacted in 1965, it was projected to cost $9 billion by 1990. Real price that year: $67 billion. There are often disagreements between the Congressional Budget Office, which produces estimates for Congress, and the Office of Management and Budget, which produces them for the administration. The CBO re-confirmed last week its $400 billion estimate. The difference is in the assumptions the actuaries use in their computer modeling. “It’s difficult to predict the behavior of 40 million people in a market that does not now exist,” one official said. In other words, no one knows. Do the liberals, who think that the benefit is too meager, expect that the higher cost estimates are going to help them in their argument that the benefit needs to be made even richer, largely by plugging the doughnut hole in the drug benefit? Their answer, of course, is to decry the provision in the new law that prohibits the government from “negotiating” lower drug prices from pharmaceutical companies. But governments don’t negotiate prices, they dictate them. This is also known as price controls. Finally, the Medicare bill contains changes that are going to alter the market by engaging more competition and market forces, and those changes are traditionally very hard for actuaries to estimate. One bit of news that opponents of free markets wouldn’t have expected came from Boston this week. An Associated Press report said that Massachusetts seniors will actually see their health insurance premiums fall in March. The three largest Medicare HMOs said premiums would be reduced 36-48 %. The sharpest decrease will be for members of Blue Cross’s Medicare plan, where premiums will drop from $162 to $84 a month. The company said it would apply all of the new revenues it is getting from the government to lowering premiums. Imagine that! A private sector health care firm is actually taking action to lure more customers to its plan by reducing prices. The health sector might actually start to work more like the rest of the economy. Some people don’t like the Medicare law, but there’s a lot more in it than the drug benefit, including a real prospect for change. There were a number of other important events, papers, and reports last week. Greg Scandlen wrote a new paper about the crushing regulatory environment in Maryland, and Joe Antos and Jack Calfee have produced a touchstone paper on the Medicare law, with a concise description of its highlights and valuable insights. See below for summaries. Also, Gail Wilensky testified on the uninsured before a Senate committee. And then there was our visit to the White House. For more, click here. Maryland?s two competing proposals for mandatory universal coverage are ?doomed to fail? because they do not address the need for fundamental reform, writes Galen?s Greg Scandlen. Maryland is one of the most highly regulated states in the country – it has the most mandates of any state, a Health Care Commission that has created a regime in which two insurers control 88% of the small group market, and one of the most restrictive Certificate of Need programs in the country. ?Rather than establishing more mandates and regulations, it is well past time for Maryland to try something new,? writes Scandlen: ?Rely on the common sense of its citizens to make their own decisions about their health care needs, and tap into the energy of a competitive private sector to deliver valuable services at reasonable costs.? Joe Antos and Jack Calfee of the American Enterprise Institute write that the drug benefit and expansion of health plan competition enacted in the Medicare Prescription Drug, Improvement, and Modernization Act of 2003 promote market principles. However, those major reforms do so with heavy regulation: private plans will be given more opportunity to offer services to seniors, including subsidized drug plans, but with restrictions that could blunt the effectiveness of competition in restraining cost growth. The new law also tweaked the Medicare system in a number of ways, continuing a long tradition of creating new regulatory complexities in a vain attempt to ameliorate the distortions caused by old rules. Robert Goldberg of the Manhattan Institute describes his experiences with the health care system as he tried to find care for his daughter, who is struggling with bulimia. ?Today, she is on the road to recovery, thanks to a mix of new medicines, caring therapists, savvy specialists, her own courage and my ability to set aside tax-free money that I used to pay for the best care possible,? writes Goldberg. ? [U]nder the president’s proposal, millions of children like my daughter will have the chance to obtain the best care possible for devastating and life-ending illnesses like bulimia, bypassing insurance companies and government-run programs that ration access to cutting edge cures in the name of universal care.? Health care consistently ranks among the top issues voters are most concerned about, yet it has been a ?non issue? in helping voters decide which Democratic presidential candidate to support, writes Ronald Brownstein, staff reporter for the Los Angeles Times. Virtually all of the candidates? plans propose expanding coverage to the uninsured through public programs, making it hard for voters to distinguish one plan from the next, but they also throw in a mix of initiatives drawn from the Republican playbook, like tax credits and new types of insurance purchasing arrangements. 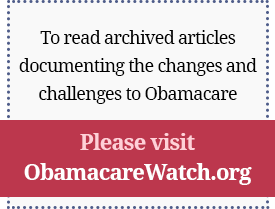 The article provides a thumbnail description of the health reform proposals of the Democratic presidential candidates. Since 1980, annual per capita health care expenditures have increased by $2,254, but this study by distinguished researchers Bryan Luce, Frank Sloan, and Josephine Mauskopf quantifies the value of that extra spending: Annual death rates have declined by 16%; life expectancy has risen by 3.2 years; disability rates for people over 65 declined by 25%; and people spend 56% fewer days in the hospital. Without these improvements in health, the U.S. would have spent $634 billion less on health care between 1980 and 2000, but there would have been 470,000 more deaths, 2.3 million more people with disabilities, and 206 million more days spent in the hospital. Their bottom line: ?Each additional dollar spent on health care services has produced health gains valued at $2.40 to $3.00.? The Pacific Research Institute hosted a debate on prescription drug importation this week in San Francisco, featuring Dr. Milton Friedman, Congressman Gil Gutknecht, Sally C. Pipes, and Don McCanne, M.D. The transcript of this debate can be viewed at: http://www.pacificresearch.org/press/rel/2004/ma04-01-27/transcript.pdf. Wednesday, February 4, 2004, 12:00 noon – 1:00 p.m.
For additional details and registration information, go to: http://www.heritage.org/Press/Events/ev020404.cfm. Monday, February 9, 2004, 5:30 ? 7:00 p.m.
For additional details and registration information, go to: http://www.aei.org/events/type.upcoming,eventID.488,filter.all/event_detail.asp.